Explore Frederick County on Two Wheels: Take a Bicycle Ride! Fall is the perfect time of year to explore scenic Frederick County by bicycle. The unique geography provides a wealth of cycling opportunities to suit a wide variety of skill levels. Regardless of whether you’d prefer a leisurely ride on the C&O Canal Towpath, a more challenging ride through the heavy rolling terrain of northern and western Frederick County, a thrilling mountain bike trek down a trail at Gambrill State Park, or a jaunt through Baker Park into the heart of downtown Frederick, there’s something for everyone. Where should you begin your cycling journey? 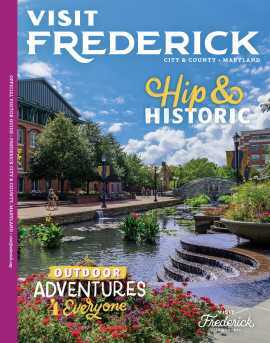 Stop in the Frederick Visitor Center and pick up two bicycling brochures -- the Frederick History Bicycle Loop and Heritage Bicycle Tours brochures. The Frederick History Bicycle Loop is a 10-mile loop through the City of Frederick, named a “Bicycle Friendly Community” by the League of American Bicyclists, with stops at 22 sites. Most of the sites have ties to Frederick’s rich history, from Schifferstadt Architectural Museum to the Hessian Barracks to the Francis Scott Key Memorial and Civil War sites. The Frederick History Bicycle Loop takes at least two hours to complete or it can be spread out over an entire day of exploration through the Frederick’s 50-block historic district. The Frederick County Heritage Bicycle Tours brochure outlines five distinctly different tour routes throughout Frederick County, each offering unique experiences. The City of Frederick “Campaign Ride” travels through Frederick’s rich Civil War history. 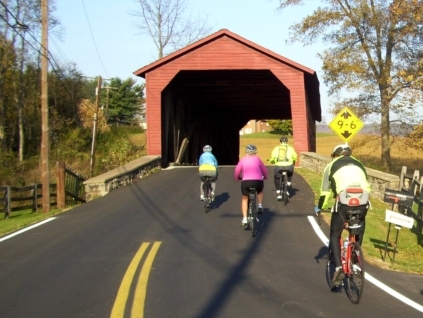 For a more challenging ride, the Transportation Heritage Trail journeys along mostly flat terrain with rolling portions that take cyclists along the C&O Canal and through historic sites and towns. On the North Country Bridge Sampler, riders venture along scenic roads to explore bridges of various design and construction, including iron and steel truss bridges and fully operational historic covered bridges. The Catoctin Mountain Challenge tour traverses Catoctin Mountain, taking bikers through a myriad of parklands with optional rural gravel roadways and off-road trails that branch off the main route. The most difficult tour outlined in the brochure, “Spirits of Burkittsville,” explores the town made famous by the movie “The Blair Witch Project.” Cyclists learn about South Mountain Battlefield, whiskey distillery heritage, and Gathland State Park. This fall get out and enjoy the history and beautiful scenic landscapes that surround you throughout Frederick County!